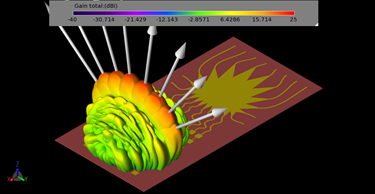 Series-fed patch elements forming an array are simulated to demonstrate antenna performance and beamforming including S-parameters, gain, and effective isotropic radiated power (EIRP) at 28 GHz. Beam steering is performed in one plane by adjusting the phasing at the input ports to each of eight elements. Download the full paper for more information.